Many factors contribute to the development of atherosclerosis, but a nutritious dietary pattern can help maintain a clear, flexible, healthy circulatory system. Arteries thicken and harden as we age as a result of the build up of plaque. Since LDL cholesterol is a key component of plaque, there's a focus on lowering serum cholesterol levels to keep arteries clear. The fact is, only one-half of all heart attack and stroke victims have elevated cholesterol levels.1 "Plaque is not just about LDL cholesterol; it's a multifactorial process," says David Becker, MD, a cardiologist with Chestnut Hill Temple Cardiology in Philadelphia. According to Becker, physicians used to believe that plaque built up over a lifetime like rings on a tree. They now know that it's an irritation of the vascular endothelium (the lining of the blood vessels) that causes plaque to form. 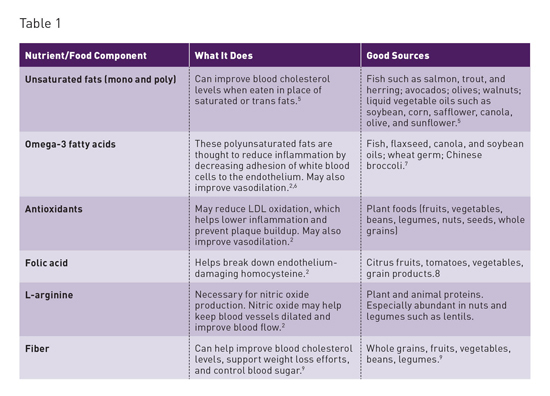 The best way to ensure patients obtain the artery-friendly nutrients described in Table 1 is to encourage an overall healthful dietary pattern. "We need to get away from trying to assign an effect to an individual food or nutrient and think in terms of dietary patterns," says Alice H. Lichtenstein, DSc, director and senior scientist at the Cardiovascular Nutrition Laboratory at Tufts University and a spokesperson for the American Heart Association (AHA). The 2013 AHA/American College of Cardiology Guideline on Lifestyle Management to Reduce Cardiovascular Risk recommends a dietary pattern of fruits, vegetables, whole grains, low-fat dairy products, poultry, fish, and nuts with limited red meat and foods and beverages high in sugar.10 These recommendations, which are in line with the US Department of Health and Human Services/US Department of Agriculture (USDA) 2015–2020 Dietary Guidelines for Americans, include all of the nutrients and food components that support arterial health. Providing patients with information on a healthful dietary pattern does not need to be complicated. "The USDA has done an excellent job of taking all of the latest research and making it accessible to the public using MyPlate," says Angel Planells, MS, RDN, CD, a spokesperson for the Academy of Nutrition and Dietetics. A replacement for the food pyramid, MyPlate illustrates proper portion sizes and distribution of food groups in one visually appealing image. "MyPlate is a good place to start," says Rena Zelig, DCN, RDN, CDE, CSG, owner of Rena Zelig Nutrition Consulting, LLC, and an assistant professor and director of the master of science in clinical nutrition program at Rutgers School of Health Professions. "Additionally, the two eating patterns that are the most evidence based for overall health, and especially cardiovascular health, are the DASH [Dietary Approaches to Stop Hypertension] and Mediterranean patterns." Zelig recommends using eye-catching, picture-based color handouts and wall hangings of MyPlate, the DASH diet, and/or the Mediterranean diet. Free tip sheets and handouts are available at ChooseMyPlate.gov and other websites. Recommending that colorful fruits and vegetables comprise one-half of each meal and encouraging foods such as beans, lentils, whole grains, and foods rich in mono- and polyunsaturated fats such as olive oil, avocados, nuts, and fatty fish will boost the artery-protecting nutrients in the diet. 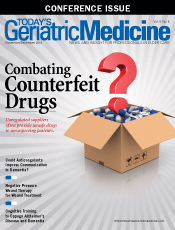 Different geriatric populations require different approaches. "For residents of long term care facilities, the onus is on staff to design a regular diet that not only tastes good but also meets the guidelines for good health," Zelig says. Those living in retirement communities with dining services expect a range of familiar choices. "It's important to include residents in menu planning and to provide them with basic education so they understand that buying into healthy choices will increase the quality and quantity of their days," Zelig says. Ensuring seniors living in the community make healthy food choices presents a bigger challenge. Planells recommends referral to a registered dietitian (RD) when possible. "RDs have knowledge, resources, and the experience to help guide behavior change," Planells says. "Unfortunately, access to a dietitian for older adults in the community is very rare. Insurance coverage really varies. Medicare covers medical nutrition therapy only for diabetes and chronic kidney disease, so a lot of the basic nutrition education falls to the primary care providers." When it comes to arterial health, diet is not enough. Quitting smoking, obtaining adequate sleep, reducing stress, and increasing physical activity are all essential to maintaining healthy arteries. Regular physical exercise not only is associated with improvement in blood pressure, cholesterol levels, diabetes, and obesity but also has antioxidant and anti-inflammatory actions that protect against the effects of aging and cardiovascular disease.3,11 "Activity trails off as we age," Planells says. "I advocate going for a walk or gardening or doing house work, anything that gets the heart rate up a little bit. If they have pain, a stationary bike or swimming pool are good choices. Ten minutes of activity here or there can easily get people to the recommended minimum 30 minutes a day." The payoff for these changes can be significant. "Less than 3% of Americans eat a good diet, exercise regularly, are not overweight, and don't smoke," Becker says, "but these people have a very low risk of heart attack and stroke." Getting older adults to alter their dietary patterns can have a positive impact on their arterial health, decreasing their risk for cardiovascular disease. "Change is hard for everybody," Planells says, "and older adults have years of habits to break. But it's never too late. We want to work toward the highest possible quality of life at every age." • vegetable oils, such as olive, canola, soybean, and corn. 1. Watson E. Heart healthy foods, the next generation: 'It's not just about cholesterol anymore ... it's about healthy arteries.' Foodnavigator-usa.com website. http://www.foodnavigator-usa.com/Markets/Heart-healthy-foods-the-next-generation-It-s-not-just-about-cholesterol-anymore-it-s-about-healthy-arteries. Updated March 22, 2013. Accessed June 25, 2016. 3. Caswell J. When risk factors unite. Stroke Connection. 2005;18-23. 4. Sainani GS. Role of diet, exercise and drugs in modulation of endothelial cell dysfunction. J Assoc Physicians India. 2012;60:14-19. 5. Know your fats. American Heart Association website. http://www.heart.org/HEARTORG/Conditions/Cholesterol/PreventionTreatmentofHighCholesterol/Know-Your-Fats_UCM_305628_Article.jsp. Updated April 21, 2014. Accessed July 11, 2014. 7. Foods highest in total omega-3 fatty acids in vegetables and vegetable products. SELF NutritionData website. http://nutritiondata.self.com/foods-011140000000000000000-1.html?. Accessed July 1, 2014. 9. Whole grains and fiber. American Heart Association website. http://www.heart.org/HEARTORG/HealthyLiving/HealthyEating/HealthyDietGoals/Whole-Grains-and-Fiber_UCM_303249_Article.jsp#.V8h6Alc4m1s. Updated October 11, 2016. 10. Eckel RH, Jakicic JM, Ard JD, et al. 2013 AHA/ACC guideline on lifestyle management to reduce cardiovascular risk: a report of the American College of Cardiology/American Heart Association Task Force on Practice Guidelines. J Am Coll Cardiol. 2014;63(25 Pt B):2960-2984. 11. Sallam N, Laher I. Exercise modulates oxidative stress and inflammation in aging and cardiovascular diseases. Oxid Med Cell Longev. 2016;2016:7239639.